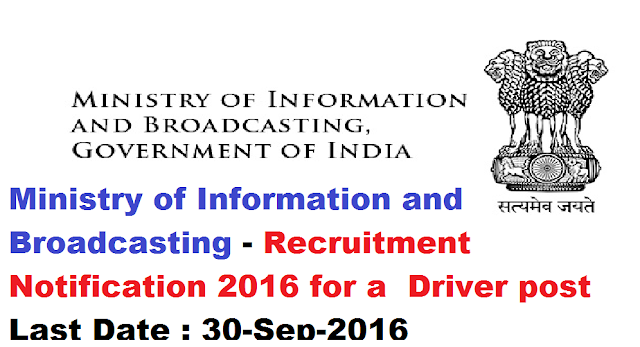 Ministry of Information and Broadcasting - Recruitment Notification fora Driver post|Ministry of Information and Broadcasting invites for eligible candidates for filling up the post of Driver (One Post) under Regional Office, DFP, Andhra Pradesh and Telangana. on or before 30/09/2016. Ministry of Information and Broadcasting invites for eligible candidates for filling up the post of Driver (One Post) under Regional Office, DFP, Andhra Pradesh and Telangana. on or before 30/09/2016. Possession of a valid driving license for motor cars. Knowledge of motor mechanism (The candidate should be able to remove minor-defects in vehicles). Experience of driving a motor car for at least 3 years. Pass in 10th Standard Desirable. Age Limit Details:Maximum age is 35. 5 years for ST candidates. 5 years for Government Servant. * Eligible candidate should fill the form with valid information following the proforma mentioned in the attached pdf. * Send it to the Address : The Director, Directorate of Field Publicity, Ministry of Information & Broadcasting, Government of India, Ground Floor, Kendriya Sadan Room No.7, Sultan Bazar, Koti, Hyderabad - 500095. Required Experience:Experience of driving a motor car for at least 3 years. Physical Requirement:The applicant should be physically fit to drive the vehicle in rural areas.